Do soccer referees discriminate when getting the book out? A few economists who also happened to like soccer did a study to see whether referees are always totally fair during games. Turns out, they’re not always - and if we learn why, we might be able to tackle unconscious discrimination in our daily lives too. According to their study - which examined 760 Premier League games in the 2007-08 season - non-white, foreign players from poorer countries were 15% more likely to get a booking than other players. So what does this say about the men in the middle? to help us look into this question. Turns out, the players who got more bookings could be grouped as 'oppositional identity' players, meaning they are opposite to the majority (in this case white Britons). In the case of the soccer study, this tends to mean non-white players who come from foreign countries with a GDP per capita of less than $10,000. You've probably heard this term being used a lot. It stands for Gross Domestic Product. It's a measure of the monetary value of all the goods and services produced in a country over a certain period of time. That means it's used as a way to gage how an economy is doing. Like most statistics, it's not perfect and many people think we might consider using different approaches, like trying to measure how happy we are instead. Others say it's is the best we have. For now, it looks like we'll be sticking with GDP for a while yet. And what’s even more surprising is that according to the findings, the referees themselves don’t even know that they’re doing this, or why. 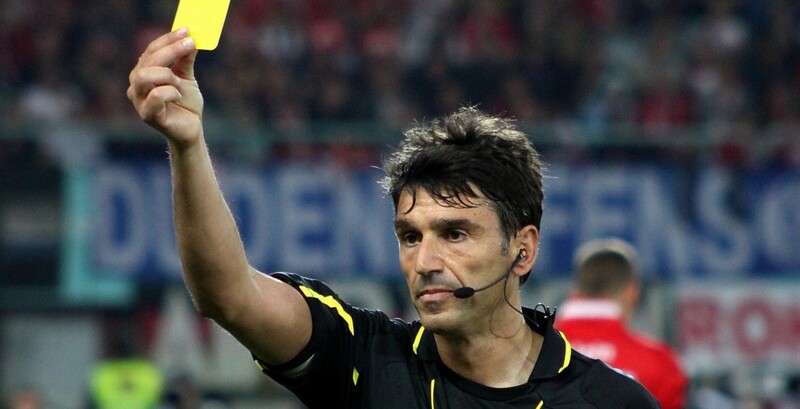 “It shows how referees in the Premier League award more yellow cards against a specific group of players,” says Edoardo Gallo, professor of Economics at the University of Cambridge, and co-author of the study along with Thomas Grund and J. James Reade. ‘Discrimination’, in this instance, just means believing a bad characteristic could be associated with a whole group of people. We might think all Italians are dishonest, but we can be either aware or unaware that we hold this kind of belief. How do we know this? Because such things tend to pop out when we find ourselves in a situation where we have to make a decision quickly, or when the decision to be made is not straightforward, as often happens in a soccer match. When we’re under pressure or when a situation is unclear, our brain overloads and goes back to using mental shortcuts and unconscious, automatic responses. These may include deeply-held, irrational notions like ‘all Italians are dishonest’, or feelings of unease and mistrust towards people from different social, cultural or racial backgrounds. The less clear a decision is, and the less time we have to make it, the more likely that unconscious discrimination will kick in. “It’s not surprising that referees resort to these rapid, unconscious decision-making processes during high paced Premier League games where some debatable decisions cannot even be resolved by expert pundits sitting in Match Of The Day’s comfortable studio,” says Professor Gallo. And it seems that referees only really discriminate when they’re rushed to make a decision. The report says: oppositional identity players are booked more for fouls that happen in parts of the field where players are rushing to put the ball back in play to orchestrate a counter-attack. It also finds that referees don’t discriminate for yellow cards where the reason behind them really obvious (like those given for abusing the referee), or for red cards, which are usually given for much clearer reasons. What can this tell us about the real world? Okay, so referees in a rushed and intense environment make unconsciously discriminatory decisions. What can this tell us about the source of discrimination outside the Premier League? As long as we’ve got time to spare and aren’t too stressed, are we safe from falling back on this kind of unconscious discrimination ourselves? Well, the world’s a complicated place. Often there are just too many different factors involved in the decisions we make, and we don’t always know what they are. If a passerby holds her purse when you walk past on the street, is it because she unknowingly holds racist stereotypes and thinks you’re going to rob her, or is it because she’s been pick-pocketed recently and is now more fearful? Or is it because she suddenly wanted to get some money out, but then quickly changed her mind? Trying to understand behaviors like this in our daily life is so incredibly difficult that instead economists try to study simplified versions of the real world, as this report demonstrates. A soccer match is kind of a simplified version of daily life, but much easier to study and understand. In a game the intentions of the people being studied are clear, participants follow well-defined rules, and there’s a lot of data available that researchers can use to work out what kind of behaviors are being exhibited and the sort of decisions being made. So perhaps studying something like the Premier League can help us understand the world outside the stadium, where prejudices and fears can come out when we least expect it, and without us even knowing. This particular study shows us that the decisions referees make may be affected by these kind of unknown beliefs, based on deep-seated assumptions, and that none of us are excluded from the possibility of behaving in the same way.